Vancomycin is commonly used in an empiric antimicrobial regimen. Clinical pharmacy at our institution has defined therapeutic vancomycin troughs in accordance with the existing literature. Still, there is no centralized protocol for initiation of vancomycin therapy. Because it takes several days to obtain a steady‐state vancomycin trough after initiating therapy and a delay in appropriate antimicrobial therapy has been shown to increase morbidity and mortality, we endeavored to see how frequently the first vancomycin trough was in the therapeutic range in critically ill intensive care unit patients. A retrospective chart review was conducted using our pharmacy's vancomycin pharmacokinelic tracking forms for June–July 2008. Initial dosing regimen, first trough, and timing of the trough were noted. Glomerular filtration rate (GFR) was estimated using the MDRD equation with patients' actual body weight and serum creatinine at the time of vancomycin initiation. Patients on hemo‐dialysis or continuous hemofiltration were excluded. Sixty‐five records were reviewed. Fifty‐four percent of patients were male, the median age was 55 years (range 22–83 years), the median weight was 85 kg (range 40–199 kg), and the median GFR was 89 mL/min (range 18–201 mL/min). The median total daily vancomycin dose was 2000 mg (range 1000–3750 mg). The median first trough was 12.6 μg/mL (range 3.7–58.8 μg/mL), drawn a median of 1 day (range 0–10 days) after initiation of therapy. Fifty‐one percent of troughs were in the therapeutic range of 10–20 μg/mL, as defined by our pharmacy, and 18% were in the therapeutic range of 15–20 μg/mL, as recommended by the American Thoracic Society and the Infectious Diseases Society of America for the treatment of health care‐associated pneumonia and meningitis respectively (Figure 1). Figure 1. Distribution of initial vancomycin troughs. Current initial vancomycin dosing practices result in a substantial proportion of first troughs outside the therapeutic range. Between one third and two thirds of all troughs are subthera‐peutic, most likely due to insufficient dose or dosing frequency. Although vancomycin dosing was adjusted after the first trough, this resulted in a delay of a median of 1 day in recommended therapy. Standardizing vancomycin dosing using an evidence‐based order set or a nomogram may improve adherence to dosing guidelines in the age of rising antimicrobial resistance and treatment failures. D. Levin, none; T. Kiser, PharmD, none; J. Pell, none; J. J. Glasheen, none. Levin D, Kiser T, Pell J, Glasheen J. 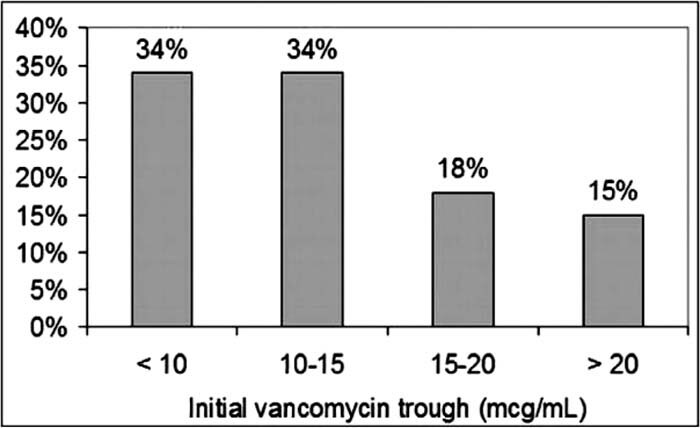 The Low Number of Therapeutic Initial Vancomycin Troughs in the Intensive Care Unit. Abstract published at Hospital Medicine 2009, May 14-17, Chicago, Ill. Abstract 61. Journal of Hospital Medicine. 2009; 4 (suppl 1). https://www.shmabstracts.com/abstract/the-low-number-of-therapeutic-initial-vancomycin-troughs-in-the-intensive-care-unit/. Accessed April 21, 2019.